Create your state of the art kitchen! The positioning of the modules in relation to each other, within the available space, optimises the cooks’ work and movements. And obviously their performance must combine power and flexibility, to achieve the desired cooking precision and quality, to satisfy the guests. 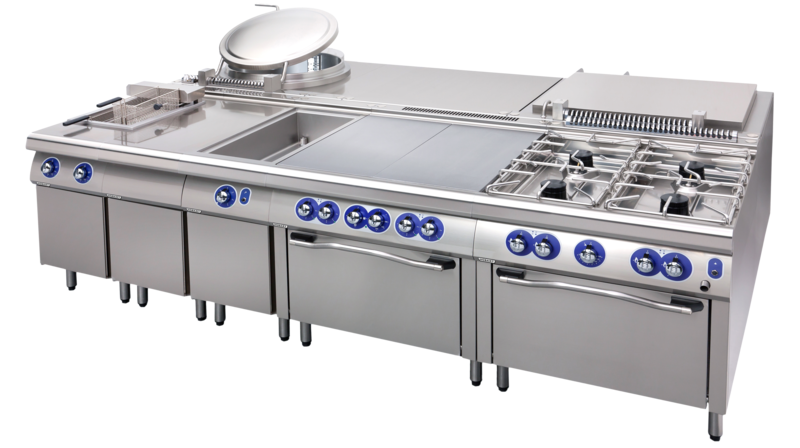 The monobloc construction of each module, in both 700 and 900 ranges, all in stainless steel, warrants solidity and long life of the cooking suite. The HOBART 900 range, as well as the 700, offer a wide choice of modules to satisfy requirements of modern restaurant as well as institution kitchens: open burners, solid tops, electric plates, grills, griddles, fryers, kettles, tilting braising pans, induction, etc. The sleek design gives the suites a contemporary look, ideal for open kitchens, but first of all fulfils professionals expectations regarding hygiene and safety. Top modules are 270 mm high (425 with flue risers). They can be set on 630 mm high support legbases with undershelf. Some of them can also be ordered on open base cabinets with adjustable feet. Doors for these cabinets can be ordered separately. Monobloc modules or modules on base cabinets are 900 mm high (1,055 mm with flue risers), with adjustable feet. They may be used as stand alone, or in a traditional suite on feet. Optional VAE electric ignition with pilot flame for open burner is available only as a factory installed option, retrofit is not possible.